Homemade salad dressings are, for the most part, quite easy to make; unless you taste some, however, you might never make your own. I did not even bother to read dressing recipes until I tasted a friend's homemade French dressing...not only did her recipe make a substantial quantity economically, but the flavor was fresh and somehow more real than its bottled, commercial competitors. Even with that knowledge and experience, I cannot say that all of our salads have homemade dressings on them. Lack of time or energy does play a part in my salad dressing cycle: I make a wonderful dressing and use it up while enjoying every salad bite. Then, I somehow become distracted with too much to do and wind up buying a commercial brand which does not compare to the homemade choices; the half-used bottle is left to languish in the fridge until it becomes rancid...which means that I wind up throwing out the contents and soon after...proceed to make another jar of one of my favorite, amazingly fresh dressings. Another anomaly is that the picture below shows a cut wedge of iceberg lettuce with the dressing drizzled over it. Cutting lettuce, wedges of lettuce and only iceberg lettuce for a salad are big NO-NOs in the snobby chefs' world, but...it tastes great...it is easy...and I love it! 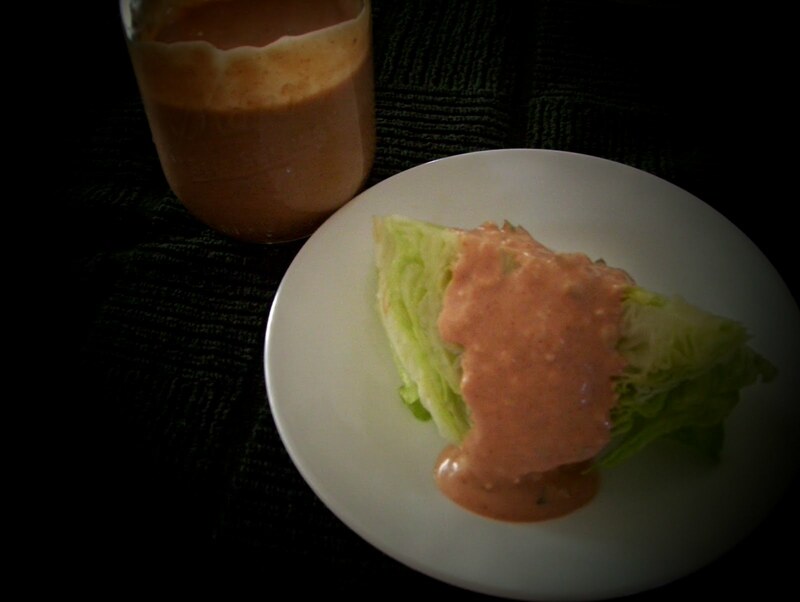 This thousand island dressing recipe is wonderful, inexpensive and is sure to be eaten up long before it expires. Add 2 T finely chopped green pepper and 1 T chopped dill pickle or relish. Makes 1 ¼ C. Keeps for 1 week.